The Watson Marlow 624Di Peristaltic Pump provides reliable use and protection against corrosion both inside and out. This wash down duty rated pump features IP55 for ingress protection against dust and fluids and can be cleaned in place or steamed in place. This peristaltic pump has a powder coated aluminum drive, a rugged die cast case with IP55 protection, and a safety interlock guarded pump head, that accepts 12mm or 17 mm industrial or SureLoad elements. The 624Di is continuous duty rated, with a speed range of between 4 and 200 rpm, a flow rate of 11.8 L per minute, and pressures up to 2 bar (30 Psi). 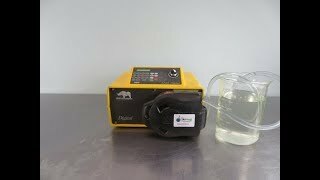 Maintaining this peristaltic pump is simple, with LoadSure elements that take one minute to change. The Watson Marlow Pump can be controlled manually from the upfront control panel for start stop and priming, or remotely through the 6 pin water tight socket connection in the rear. Instrument has been tested with clean bill of health. System overlay is marred up on the down arrow button, but functions just fine. We ran multiple tests and pump is working up to factory specification. This Watson Marlow 624Di Perstaltic Pump has been fully inspected and operated without issue. System overlay is marred up on the down arrow button, but functions just fine. We ran multiple tests and pump is working up to factory specification. All of our lab equipment comes backed with our standard warranty. Should you have any questions, please don't hesitate to contact us.